Hidden Creek's well-equipped private fitness center is the perfect place for your daily workout. 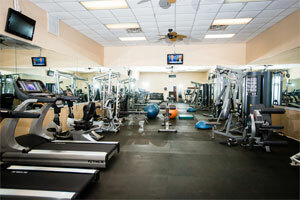 The fitness center has the machines, the weights and the cardio equipment to get you in shape and keep you toned. Hidden Creek also offers Personal Training with our own Club Trainer Nik Morar. Nik welcomes new Members with a complimentary 1-hour fitness assessment and will show you how to use various machines. The fitness center is open year-round, 7 days a week.